Architectural Angle is made from 6063 Series Aluminum. 6063 aluminum angle is often finished with a T6 or T52 treatment. A T6 Temper means that the extrusion is heat treated and artificially aged. A T52 Temper means that the extrusion is cooled from an elevated temperature shaping process and artificially aged. The Temper affects the mechanical properties of the end product. 6063-T6 has a tensile strength of 25,000 psi and a yield strength of 25,000 psi. The 6063 alloy has a smooth finish that is conducive to finishing or anodizing. The first difference between architectural aluminum angle and structural aluminum angle is the profile that is extruded. 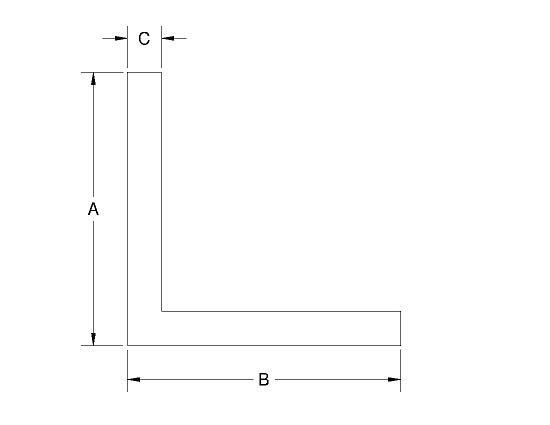 Architectural angle has a constant thickness throughout the piece with a sharp 90 degree angle on the outside and inside where the two legs meet and is a constant thickness to the very end of the piece.